Stand out: Mayor George Brticevic puts the finishing touches to the roundabout on the intersection of Gilchrist Drive and Therry Road. 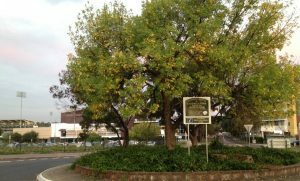 A couple of years ago Mayor George Brticevic suggested that while there were some well designed roundabouts in Campbelltown there could be more of them. He singled out roundabouts in Macquarie Links, Leumeah and one or two others that could be used as models. Cr Brticevic then suggested staff look at roundabouts which could be given a facelift to make them stand out more. The result of that call is that the first in a program of roundabout landscaping projects across Campbelltown City was delivered this week. A roundabout near the retail centre of the city at the intersection of Gilchrist Drive and Therry Road has now been upgraded as part of the council’s roundabout beautification program. A total of 13 roundabouts have been identified for the landscaping works to be completed in the next 12 months. “This initiative provides us with the opportunity to enhance our streetscape at some of the key entry points across our city,” Mayor George Brticevic said. “Landscaping roundabouts improves the appeal of the roadway while achieving a good environmental outcome at the same time,” Cr Brticevic said. “We recognise that roundabouts are a vital part of our road infrastructure and are planning landscaping with safety at the core,’’ he said. The next roundabout planned for improvements is O’Sullivan Road and Lindesay Street, Campbelltown which will begin late March next year. 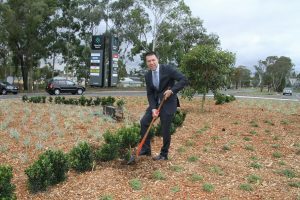 And by the time all 13 have been done, Campbelltown will be able to boast some of the best looking roundabouts in the state. The roundabout next to Leumeah station.